This is the sixth—and final—in a series of reports predicting dairy innovation rollouts in 2017. Last week I wrote about how the clean food movement in extending beyond ingredients to now encompass process. If you missed the blog, you can link HERE to read it. The idea of process—from the sourcing of ingredients to the actual production of ice cream--will be an integral part of ice cream innovations in 2017. Think artisan, hand crafted and small batch. In addition, many new ice cream flavors will be lighter and brighter in appearance. There will be a return to less being more in 2017. 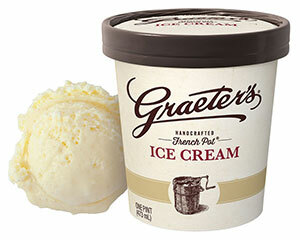 Graeter’s has long recognized the importance of process. This family-owned ice cream maker remains dedicated to the small-batch French pot process. Passionate artisans pour and swirl the best ingredients into each spinning, 2.5-gallon French pot freezer. The resulting ice cream is so dense and rich--due to the absence of air--it must be removed by hand with a paddle. That’s how Graeter’s has been hand-crafting ice cream since 1870. The company is right on target with what today’s consumer is looking for. Here are eight trends driving ice cream innovation in 2017. 1. Preparation Descriptions. Cooking methods are described on all types of foods these days, as it makes the consumer feel more involved, more knowledgeable. Cooking methods also impart unique flavors that entice the taste buds. Expect to see more inclusions described this way. For example, think toasted coconut, grilled pineapple, caramelized banana and smoked apple. In addition, descriptors such as sun ripened, hand harvested and homemade will be more common. But don’t overdo it! Be discerning with how descriptive you are in order to not overwhelm the consumer. 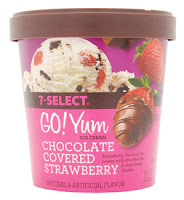 The 7-Eleven convenience-store chain does a nice job with its latest addition to its private-label 7-Select GO! Yum brand of ice cream. Side panels of pints of new Chocolate Covered Strawberry include this description: Naturally sweet, vine-ripened strawberries combine with fresh cream and chunks of chocolatey goodness for a premium rich indulgence. Bursting with fresh flavor, it’s pure delicious bliss. 2. Fruit and More Fruit. Candies and cookies will still be added to ice cream, but expect to see more real whole fruit being added and often in unique combinations. The challenge with fruit is to keep it soft and intact. Premium juice and sugar-infused fruits keep them malleable and prevent ice crystal formation. Tropical combinations and sweet with a touch of heat will be trending, along with berry and citrus combinations. Think of a Farmers Market series. 3. Butter, Cream and Dairy Variegates. Fat is back and tastes delicious. Think butter flakes (maybe with a touch of see salt), swirls of sweetened condensed milk and mascarpone variegate. Light in color but full of flavor, these ingredients add extra all-natural richness. Buttermilk, cheesecake and even pudding will trend, often in combination with fruit. 4. Sweet Flavors. With added sugars, in particular refined and processed sugars, being highly scrutinized for their negative impact on health, marketers of all types of foods and beverages have started flagging sweetener type in product descriptions to potentially give the product a more healthful halo. Expect to see agave, brown sugar, honey and maple syrup as part of an ice cream’s flavor description. 5. Coffee. Cold-press coffee is all the rage in the ready-to-drink beverage sector and is making its way into ice cream. 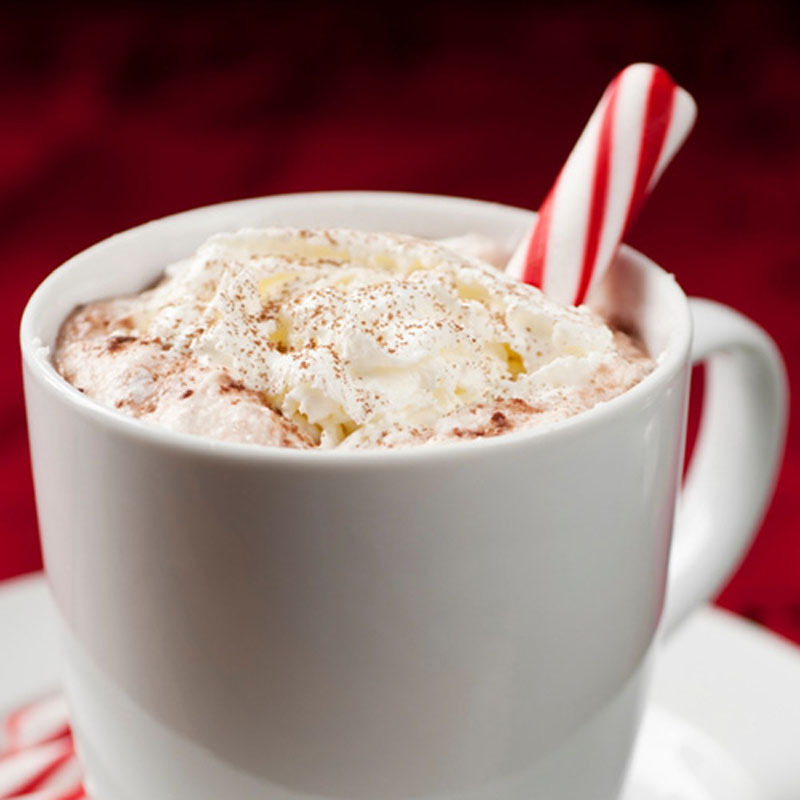 Expect to see many coffee flavor pairings, such as coffee plus cream…flavored creamer…in the form of a frozen dessert. 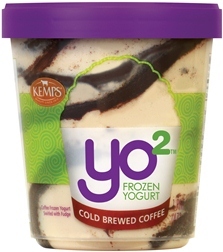 Kemps recently introduced Yo2 Frozen Yogurt pints. One of the six flavors is Cold Brewed Coffee, which is coffee frozen yogurt, thick fudge swirl and chocolate chips. 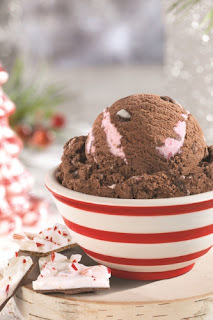 There’s also Mudslide, which is chocolate and coffee frozen yogurt swirled with cookies, fudge and chocolaty chunks. And there’s Vanilla, which is described as simply vanilla. 6. Vanilla. Clean, simple, pure, light and bright, that’s what you get with vanilla. 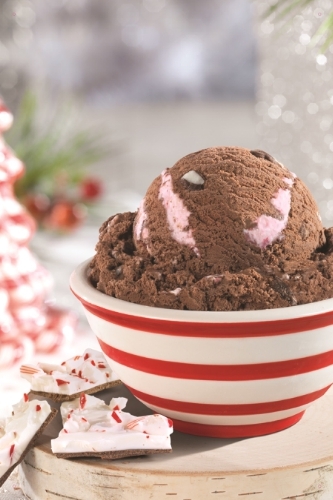 Chocolate has long been a dominating base in ice cream innovations. In 2017, it will be vanilla, with an emphasis placed on the sourcing of the vanilla. Bean specks will be more prevalent as well, as they are suggestive of a product more in touch with nature. 7. Chocolate. Chocolate is not going away but in 2017 expect to see chocolate as more of a subtle inclusion rather than a dominating base. The chocolate may also be paired with other ingredients to create unique textures. Think chocolate-covered ancient grain clusters, chocolate-covered almonds and chocolate-covered cherries. Now think of all three of those in a pint of French vanilla ice cream. In keeping with the light and bright theme, there will be more creative uses of white chocolate. 8. Salted Caramel. This flavor continues to evolve and will increasingly be included as an inclusion or variegate rather than be the dominant flavor. 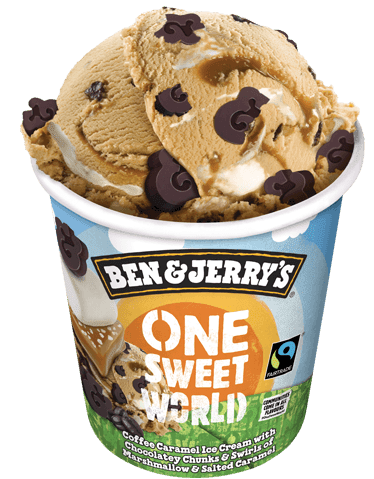 For example, this month, Ben & Jerry’s is debuting One Sweet World in select European markets. The new flavor features Fairtrade coffee and caramel ice creams, marshmallow and caramel swirls, and chunky chocolate ampersands, all lovingly churned together to tantalize the taste buds. And you know what makes this all the sweeter? Ben & Jerry’s has partnered with H.O.P.E. (Helping People Everywhere) not hate. 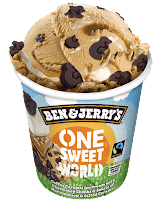 Sales of this flavor will help fund various projects run by the organization, which contribute to more inclusive communities to make One Sweet World. This is the fifth in a series of reports predicting dairy innovation rollouts in 2017. Tired of hearing the term clean label? Well, it’s not going away. How a brand chooses to address the clean-label movement is very personal, as there’s no formal definition, yet many companies claim to be doing it. That pure form is as much about ingredients as it is process. An informed consumer is a satisfied customer. Moving forward, it may not be enough to be clean and simple. Consumers increasingly want full disclosure regarding food additives, including source and function, as well as how a product is made. 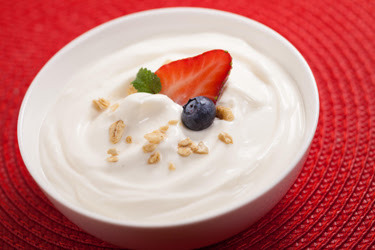 Think about Greek yogurt. This is something we missed when trying to figure out what made Greek yogurt such a game changer. Yes, it’s higher in protein. Yes, it tastes different. Yes, it has a different texture and mouthfeel than mainstream yogurt. And YES: authentically produced Greek yogurt is made using a more hands-on approach, a different process. Consumers were as fascinated about the product as the straining process. They likely imagined Greek dairymen standing around a strainer watching the product thicken for hours at a time. This is not the original Chobani bicyclist love story, but it still supports the process theory. View the 30-second video HERE. Now think cold-brew coffee. It’s the hottest trend in the ready-to-drink chilled beverage sector (pun intended). It’s as much about product as it is process, once again supporting the importance of communicating the process to consumers. Cold-brew coffee, also known as cold press, is coffee brewed without heat. Cold brewing requires steeping beans in ambient- to cold-temperature water for a long period of time. The type of beans, the ratio of beans to water, the temperature of the water and the steeping time all impact the final product. Processors differentiate their product by manipulating these variables and communicate this to consumers. Consumers connect. It makes them feel special to imagine that a batch of beans was steeped almost a half day to make their beverage. It’s artisan. It’s craft. It’s about the process. In 2017, commit to clean label and clean process. The two are the perfect marriage. And the dairy industry is well poised to be a leader in the clean food movement. There may not be any better place in early 2017 to learn about innovative processes to assist with creating a point of differentiation in the crowded marketplace than the inaugural ProFood Tech, which will be held April 4 to 6 in Chicago. For more information on ProFood Tech, where the Daily Dose of Dairy Live will take place all three days on the show floor, link HERE. This is the fourth in a series of reports predicting dairy innovation rollouts in 2017. Whey--once considered a byproduct of cheesemaking is now one of the most in-demand ingredients, in particular in the beverage business. Fluid milk processors would be wise to stop focusing so much on processing and packaging ordinary white and flavored milk and think outside the gallon and half gallon to single-serve bottles, cans, cartons and even pouches of whey (and other dairy protein)-containing beverages. These might be clear water- or juice-type drinks, meal replacements or even energy drinks. Polly Olson, vice president of new business development, sales and marketing at AGROPUR, confirmed that the use of whey proteins in consumer beverages, as opposed to sports nutrition beverages where whey has long been the shining star, is soaring, and shows no signs of slowing down. According to a report from BCCResearch, the global whey protein market will reach $13.5 billion in 2020, up from $9.2 billion in 2015, registering a compound annual growth rate of 6.5% for the period of 2015 to 2020. For years, whey protein has been the go-to ingredient in the sports nutrition sector thanks to its anabolic benefits such as increased muscle protein synthesis and muscle growth. However, increased focus on health across age groups and gender is driving use of whey protein beyond athletes and sports enthusiasts. The report states that while core demand for whey protein comes from the U.S. and the E.U., there is increasing demand in emerging economies, especially in Asia-Pacific and Latin America. In addition to being used in beverages, whey and other dairy protein ingredients are increasingly being used in nutrition bars, infant formula and weight-management foods. Sunshine Dairy Foods gets it. Known for its use of premium local ingredients and a cold-craft process that may take longer, but produces superior-tasting products, this Portland, Ore., dairy is now playing in the protein beverage space with the recent introduction of Sunshine Power. Packaged in single-serve 16-ounce gable-top cartons, each container delivers 30-grams of high-quality dairy protein—from milk, milk protein isolate and dairy product solids. Each powerful serving packs in 420 calories, 19 grams of fat, including added omega-3 fatty acids, and 24 grams of total sugar, in addition to the 30 grams of protein. To keep total sugars low, and to be able to state the product contains no added sugars, the refrigerated beverage is slightly sweetened with stevia. Through the addition of lactase enzyme, the product is also lactose free. For Goodness Shakes, a leading ready-to-drink protein shake brand in the U.K., introduced three new products this year. Protein Water contains no sugar or fat and is only 86 calories per 500-milliliter bottle. Packed with 20 grams of whey protein isolate, the beverage is designed to hydrate before, during and after training. Protein Coconut Water contains no added sugar and no fat. Each 330-milliliter bottle contains 52 calories and 10 grams of whey protein isolate. The beverage base is naturally hydrating coconut and spring water. For a healthful breakfast on the go, there’s new shelf-stable Protein & Oats, an enriched milk drink that contains 14 vitamins and minerals and packs in 25 grams of protein from whey and casein. Each single-serve bottle also contains 20 grams of finely ground oats, which function as a source of slow-releasing energy. The meal-in-a-bottle has no added refined sugars. The only sugars are those naturally present in the oats and dairy ingredients. The unique formulation is designed to be a satiating first meal of the day and comes in two traditional porridge flavors: Original and Banana & Golden Syrup. Nestlé USA is rolling out Nesquik Protein Plus flavored milk drink, with each 14-ounce single-serve bottle containing 23 grams of protein to help consumers reach their protein-intake goals for the day. Labels flag “proudly made with real milk,” with ingredient statements identifying low-fat milk as the first ingredient. A protein boost comes form added milk protein concentrate. Nesquik Protein Plus comes in Chocolate and Vanilla flavors. The milk drinks contain no artificial sweeteners and labels make the claim that the drinks have 28% less sugar than the leading protein-enhanced flavored milk. It is shelf stable until opened. 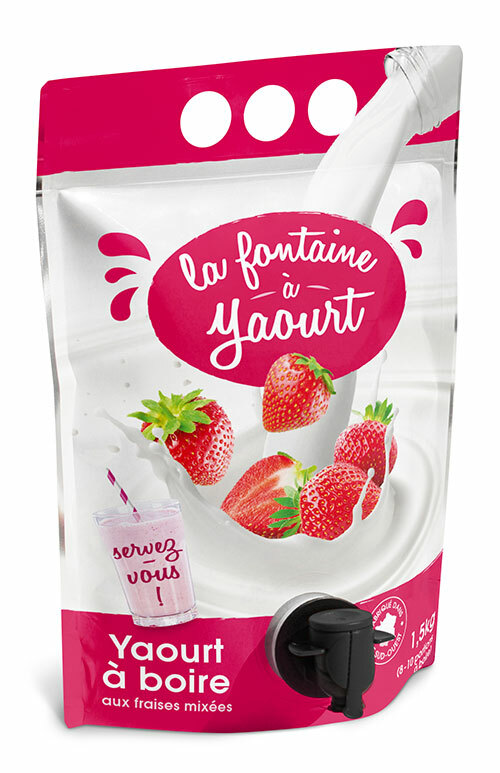 BiPro USA, a consumer brand of AGROPUR, has added a strawberry flavor to its line of whey protein isolate powders. Strawberry joins unflavored, Chocolate and French Vanilla. BiPro’s strawberry iteration stays true to the brand’s clean label. The product contains just six ingredients, 90 calories per serving and zero grams of sugar. Just like every other BiPro flavor, strawberry carries 20 grams of protein per serving and is NSF Certified for Sport, ensuring that it is free of banned substances. 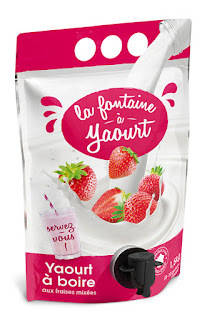 The product is naturally sweetened and naturally flavored with real strawberry pieces. In June, the brand introduced ready-to-drink BiPro Protein Water. Each 16.9-ounce bottle contains one scoop of BiPro (20 grams of protein) and stays true to the brand’s clean label. The ingredient legend includes only five items: water, whey protein isolate, phosphoric acid, natural flavor and stevia extract. A single-serve bottle contains zero grams of fat, sugar and carbohydrates and just 90 calories. 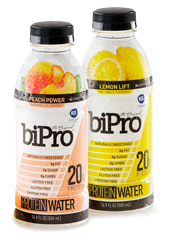 BiPro Protein Water comes in Lemon Lift and Peach Power flavors. PowerBar, the original energy bar, has added Clean Whey Protein Drinks to its rapidly evolving portfolio of real and energizing foods. In response to consumer requests for cleaner ingredient labels, PowerBar Clean Whey products feature no artificial sweeteners and high-quality whey protein for sustained energy. 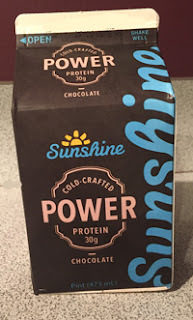 A single-serve 16.9-milliliter bottle of the drink contains 15 grams of whey protein, 0 grams of sugar and 70 calories, as a result of being sweetened with stevia. It is a light, refreshing alternative to a traditional dairy-based protein shake and can be used during or after a workout, as a healthy snack or meal replacement, according to the company. The drink comes in Berry Pomegranate and Fruit Punch flavors. 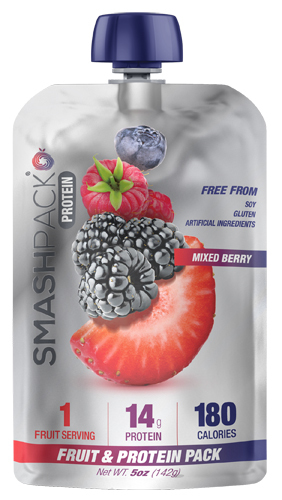 SmashPack Protein is a new all-natural, high-protein and real fruit nutritional snack. These spouted squeeze packs are for athletes and anyone on-the-go looking for a quick, healthy snack/meal replacement made from real food. Each pouch is packed with 14 grams of high-quality whey protein, one serving of real fruit, 5 grams of healthy fats and is only 180 calories. The line of protein packs come in three flavors—Mixed Berry, Orange Peach and Tropical Fruit--each with a short list of recognizable ingredients. SmashPack Protein is shelf stable and free of soy, gluten, artificial ingredients, and is naturally sweetened by the fruit it holds. Wisconsin Specialty Protein now offers ready-to-drink Tera’s Whey Protein beverage. This shelf-stable drink comes in two flavors—Chocolate and Vanilla Bourbon--with both packing in 26 grams of whey that originated from milk from grass-fed Wisconsin cows. The protein sources are whey protein isolate, milk protein isolate and nonfat dry milk. Sugars are kept low by using organic stevia in combination with organic unrefined cane sugar. 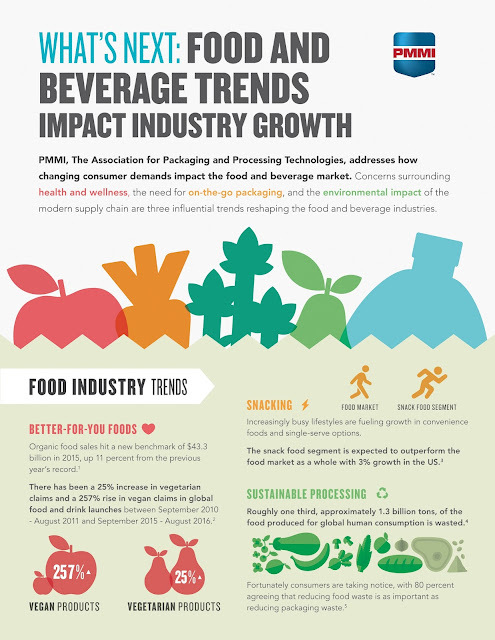 The whey- and other dairy protein-containing beverage segment is poised for innovation. It's time to get on board. Photo source: Di Bruno Bros. This is the third in a series of reports predicting dairy innovation rollouts in 2017. With snacking now ubiquitous--more than three in five (64%) consumers agree that snacking is necessary to get through the day, including 77% of millennials, according to Mintel data—food and beverage marketers are aggressively developing what they believe will be a winner with the growing number of snackers. Mintel data also show that millennials are more likely to be motivated by healthy snack options (68%); and that three in four (73%) consumers are willing to pay extra for snacks made with high-quality ingredients. 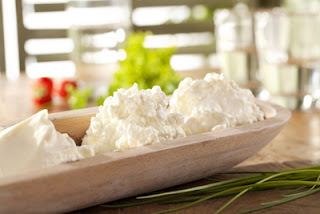 Reinventing cheese as a snack and emphasizing its healthful halo—it’s packed with protein and numerous essential nutrients--is one of the hottest trends. 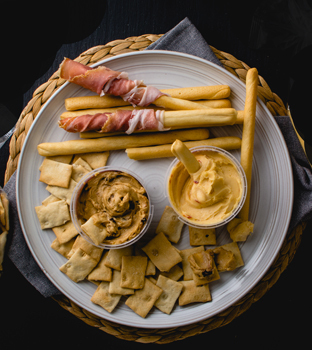 There’s a plethora of cheese snacks made with premium, all-natural ingredients rolling out by marketers, both big and small. Some are designed for the convenience channel, while others come in bulk for consumers to grab from their refrigerator as they run out the door. Still others are designed for spreading or dipping, with the carrier being everything from a bagel to a crudités. To read an article I wrote on this topic for Food Business News, including a slide show of recent innovations, link HERE. According to data from IRI provided to Dairy Management Inc., and courtesy of the Midwest Dairy Association, almost half (47%) of U.S. households purchase cheese forms associated with snacking at least once a year. The average buyer makes 4.6 trips per year to the store for snack cheese, purchasing 5.0 pounds during the year. The heaviest buyers are households with children, especially households with children between the ages of 12 and 17. Snack cheese forms also skew towards Caucasian, higher income, and younger (Millennial) households. Some innovative new cheese snacks are intended for children while others have adult’s palates in mind. Many are one-size-fits all in order to appeal to everyone in a household. Here are 10 unique examples. Denver-based WhiteWave has been in the cheese business for a number of years with organic chunks, slices and shreds, as well as multi-serve packs of sticks and shapes for snacking. 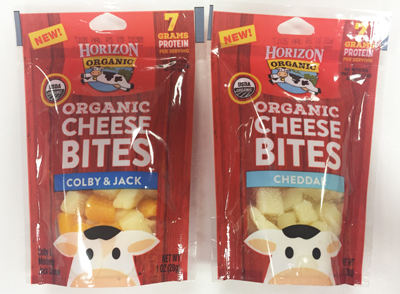 Now the company is entering the grab-and-go segment with individually wrapped 1-ounce sticks of organic mozzarella that come in convenient 24-pack merchandising units. There’s also new 1-ounce pouches of organic cheddar and organic Colby and jack bites. Winona Foods now offers Alejandro On The Go snack cups designed for cheese lovers on the move. 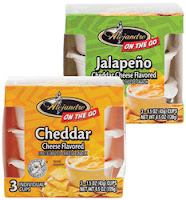 These pasteurized snack packs are made with real Wisconsin cheese and are available in cheddar and jalapeño varieties. The 1.5-ounce portion cups, which are sold three to a carton, have a one-year unopened ambient shelf life and are perfect for snacks and lunches, dipping chips or fresh vegetables, or spreading on a sandwich or burger. Just in time for holiday entertaining, Philadelphia-based Di Bruno Bros., launched two new cheese spreads: Pinot Grigio & Fig and Smoked Gouda & Beer with Pimentos. Made with real Wisconsin cheddar, the two new varieties join Spicy Abbruzze, Roasted Garlic & Herb, Port Wine, Gorgonzola, Provolone & Chianti, and Cheddar & Horseradish. Pinot Grigio & Fig Cheese Spread is made with aged cheddar, white wine and figs. It is a sweet and savory spread with identifiable pieces of fig. The Smoked Gouda & Beer with Pimentos Cheese Spread has a nutty, smoky taste that gets amplified with a splash of brown ale. 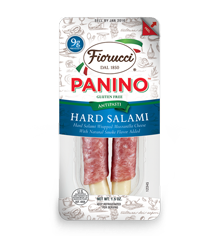 Fiorucci Foods now packs its popular cheese and meat rolls into single-serve two packs. There’s mozzarella with hard salami, pepperoni or prosciutto, as well as hard salami with pepper jack. 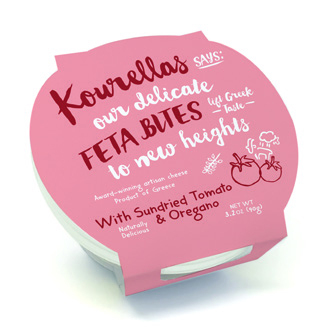 In Greece, Kourellas markets a range of Feta Bites, which are snack-sized pieces of feta cheese in 90-gram containers. There’s a plain version, as well as seven seasoned options. They are: Garlic & Pepper, Greek Herbs, Olive & Chili, Poppy Seed, Sesame, Smoked, and Tomato & Oregano. Kraft Heinz Co., has big plans for cheese snacks in the coming year. First in its list is new Kraft Snack Trios, which are 1.5-ounce snack trays. As the name suggests, each tray has three compartments. One contains cheese cubes. The others include chocolate chunks, dried fruit or granola clusters. The company is also growing its P3 line with fruit medleys. Also a three compartment tray, the new medleys include cheese, cubes, dried fruit and salty nuts. 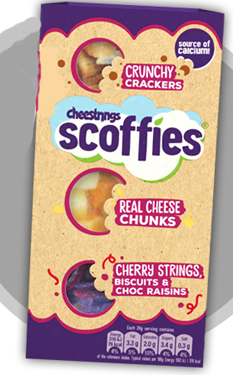 Kerry Ireland is debuting Cheestrings Scoffies. There are three varieties of this new three-container snack, with one container having real chunks of cheese. The second is either crackers or pretzels, while the third is dried fruit, chocolate and/or biscuit pieces. The three containers are described as ‘mixable,’ and offer kids the opportunity to ‘swap them,’ ‘switch them’ and ‘save them,’ as each pack has a convenient resealable tab. The Green One features crunchy crackers and a fruity mix with white chocolate shortcake pieces. The Purple One features crunchy crackers and a blend of cherry strings, biscuits and chocolate raisins. The Red One features mini pretzels and a blend of cherry cubes, yogurt raisins and biscuits. Here’s a different kind of cheese snack. 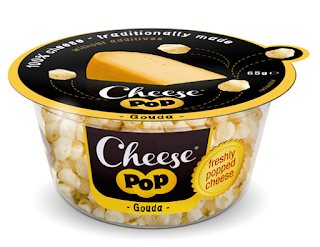 It’s popped cheese. Cheesepop comes in Emmental and Gouda varieties and is produced by the namesake company based in The Netherlands. It is 100% cheese that is simply popped. The heat dries the cheese into snack size balls that no longer require refrigeration. The crispy, airy pops come in 65-gram single-serve, convenient on-the-go cups. 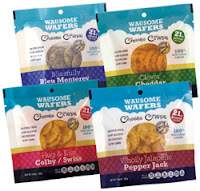 Wausome Foods has expanded its line of cheese crisp snacks with new flavors and convenient grab-and-go 1.6-ounce pouches. Wausome Wafers are now available in Blissfully Bleu Monterey and Wholly Jalapeño Pepper Jack, in addition to the original Clever Cheddar and Hug & Kiss Colby/Swiss flavors. Blissfully Bleu Monterey is made with Wisconsin Monterey jack cheese with Roqueforti cultures added for blue veining. Wholly Jalapeño Pepper Jack is flavored with real jalapeño chiles for just the right amount of heat. Wausome Wafers are made with 100% Wisconsin cheese and can be eaten as a snack or served as creative appetizers, with dips or crumbled over salads and soups. Cheese snacks are gaining traction in private label. The Meijer grocery chain just rolled out Meijer Snack Breaks. Selling for about a dollar piece, the snack packs come in three varieties. There’s pepper jack cheese with roasted peanuts and raisins; sharp white cheddar cheese with dried cranberries and sea salted and roasted almonds; and sharp cheddar cheese with cherry-infused cranberries and roasted and sea salted cashew pieces. Photo source: Milk Unleashed/Tetra Pak Inc. This is the second in a series of reports predicting dairy innovation rollouts in 2017. But wait…is everything about to change? This week there have been numerous perspectives published on the future of food under the president-elect’s administration. Later in this blog you can read insights from Mark Mansour, partner, Mayer Brown LLP, an expert in food industry regulations and someone I have relied on for insight over my 20-plus years in food industry journalism. So let’s talk the future of functional foods, specifically functional dairy foods, which are those foods that provide benefits beyond basic nutrition. 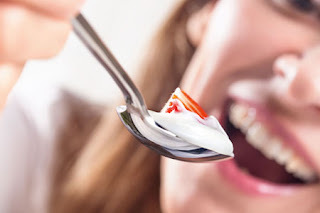 Dairy foods are one of the original functional foods, with milk still being one of the biggest players in the category as a result of vitamin D fortification. Voluntary addition of vitamin D to fluid milk started back in the 1930s when rickets, a bone-debilitating disease, was prevalent. Incidence was linked to a deficiency in this fat-soluble vitamin. Because milk was a highly consumed food, the medical community encouraged fortification. To date, vitamin D fortification of milk remains voluntary, yet the norm, in U.S. and most developed countries. Not all functional foods mitigate disease. They can deliver a myriad of purported benefits ranging from anti-aging to inducing satiety. Some provide energy while others promote relaxation. Some such foods are inherently functional, for example, a cup of brewed green tea is loaded with antioxidants, while other rely on the addition of functional ingredients. Vitamin D fortification of ALL dairy products is one of the greatest opportunities for dairy foods in the functional foods sector, which consumers continue to embrace, but some are starting to question. That’s because of the transparency issue. Dairy’s inherently clean and simple reputation makes it an ideal delivery vehicle for functional ingredients. This includes everything from vitamins and minerals to probiotics and prebiotic fibers to omega-3 fatty acids and plant extracts, such as those from green tea or red wine. What is paramount is that marketers communicate to consumers why these ingredients are being added and where they come from. I promise you, the next few years will be all about complete transparency. This is particularly true if the new Washington, D.C., regime makes changes in regulations that take us back to the ice milk ages. The fact is, Baby Boomers, in particular, are very open to functional foods. According to the National Marketing Institute, 61% of Baby Boomers use functional foods and beverages, and 54% consume fortified products. Adding vitamins, minerals and other key nutrients to dairy foods will keep Baby Boomers in the category. According to Packaged Facts, two of the most appealing “functional ingredients” to Baby Boomers are vitamin D (for bone health) and omega-3 fatty acids (for cognitive function). This week I attended the 2016 Food Tank Summit in Chicago. The non-profit’s vision is to build a global community for safe, healthy, nourished eaters. This is a beautiful vision. Its values are to: Educate. Inspire. Advocate. Change. The point is consumers are fickle. They will make compromises to suit their desires, their needs, their opinions, their beliefs. To keep consumers in dairy, in milk—the original functional food—talk about your product. This is the functional dairy foods trend for 2017. Add it. Tell them why. Explain it. The 2016 Label Insight Food Transparency ROI Study from Label Insight Inc., Chicago, was released in June 2016. Findings from the study showed that consumers want brands to be completely transparent when it comes to food, but they largely do not trust them to accurately provide complete product information. 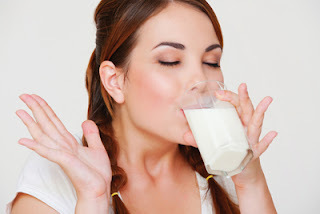 Let’s prove this study wrong when it comes to dairy foods. The study surveyed more than 2,000 consumers about their preferences for transparency and how it affects their trust for and loyalty toward brands. The results showed that consumers want more than just the required product information on a product’s label and will purchase from and be loyal to brands that provide more detailed insights. They want to see everything from a complete ingredient breakdown to sourcing information. What’s more, if a brand doesn’t provide them with this information consumers will look elsewhere for it. This puts brands in a vulnerable position, one that involves shoppers consuming (and likely believing) third-party information about their products. Trust me, this is not a place you want your customers to go. According to research by Label Insight, millennial moms are leading this move toward digital transparency. Millennial moms--mothers between the ages of 18 and 34—value transparency more than any other demographic, are significantly more interested in seeking product information through digital channels and are willing to pay more for it. This demographic represents nearly $200 billion in spending power. Millennials also love dairy. So between Baby Boomers trying to defy aging and millennials doing what millennials do, there’s a huge opportunity for functional dairy foods, if they are clean, simple and transparent. 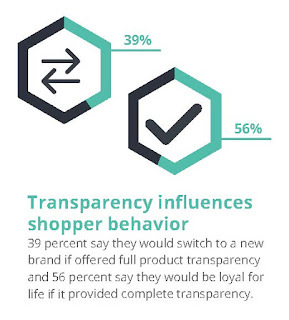 Label Insight survey research showed that product transparency influences purchasing behavior, plays a significant role in customer loyalty to a product and opens the door to the brand’s entire portfolio of products. The survey revealed that nearly all consumers (94%) are likely to be loyal to a brand that offers complete transparency. What’s more, transparency ranked highest in a list of factors that motivate consumers to be loyal to a brand, with 25% listing it as their top factor. The survey found that 39% of consumers would switch from their current preferred brand to one that offers more product transparency. Furthermore, once a consumer has switched to a brand in favor of increased transparency, he or she is likely to remain loyal long term. Fifty-six percent say they would be very likely to remain loyal to a brand for life if it offered complete transparency. Transparency is so important to consumers that they are actually willing to pay more for it. Almost three in four consumers (73%) say they would be willing to pay more for a product that offers complete transparency in all attributes (ingredients, nutrition, sourcing, etc.). When asked to indicate the importance of transparency for each product category, consumers proved transparency is important across the board. 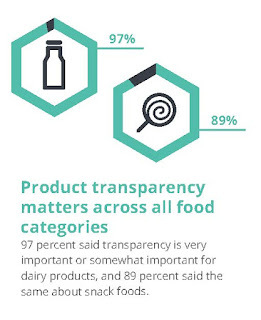 However, dairy ranked highest, with 97% of respondents indicating it is very important or somewhat important for dairy brands to be transparent, followed by produce, meat and frozen food products. Most consumers (77%) believe a food brand is transparent when it provides a complete list of ingredients in its products, followed by in-depth nutritional information about the ingredients (54%) and certifications such as USDA Organic or “low sodium,” an FDA nutrient content claim. 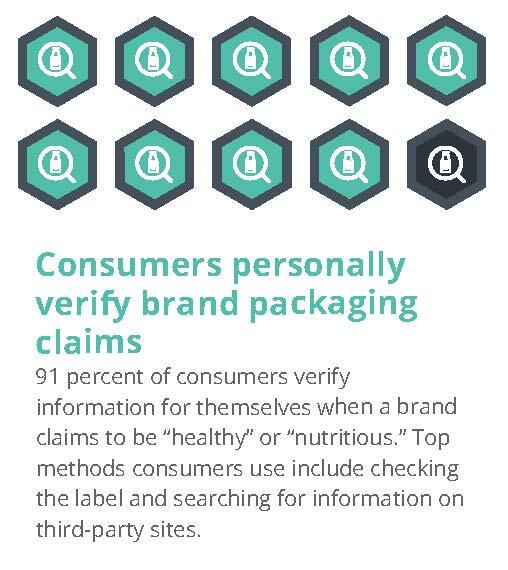 Consumers also say they want more information than brands are required to include on the physical product label. 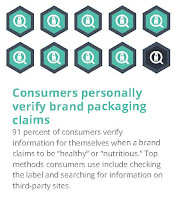 More than half (56%) say additional information on how food is produced, handled or sourced would make them trust a brand more, and this information ranked more than twice as high as brand packaging claims such as “low fat” or “low sugar.” Sixty-two percent say missing information on labels causes them to be skeptical about a brand. This distrust may increase with new governing bodies. In summary, transparency has positive implications for brands. It fosters product loyalty, brand loyalty and increases the product’s worth in a consumer’s mind. In an age where consumers are more concerned about what’s in the products they use and consume than ever before, brands that provide shoppers with the information they seek through their preferred channels will reap the benefits. This is very important in the functional foods sector, where ingredients are added for specific health and wellness benefits. For 2017: Add it. Tell them why. Explain it. The Trump transition team has stalled in its effort to vet and announce appointments, while potential appointee names continue to surface. Several high profile departures have slowed the transition to a crawl. With the removal from the HHS transition team of NJ governor Chris Christie, Rich Bagger and a number of lobbyists close to Christie. Wisconsin Gov. Scott Walker aide Andrew Bremberg becomes the transition head for HHS. It is looking likely that U.S. Rep. Dr. Tom Price of Georgia will be HHS Secretary. Dr. Ben Carson has removed his name from consideration for any position in the Trump administration. As you may have heard, the Trump transition team is asking all potential appointees to relinquish their lobbying privileges and pledge not to lobby for five years after they leave the administration, although the ban has numerous qualifiers. Based on what we are hearing, other cabinet appointments will be announced soon. The announcements will not be made in the order of importance, but rather based on the achievement of consensus regarding a particular candidate. We have had many requests for information about FTC. Our sources indicate that the key agencies will be addressed as soon as cabinet is chosen, unless there is consensus on a given agency head candidate. No names have yet emerged for FTC head, and FDA will almost certainly await an appointment of an HHS secretary. Assuming that Tom Price is chosen for HHS, look for an effort to re-evaluate numerous HHS and FDA regulations, something Donald Trump promised would happen at most departments and agencies. Our colleagues here at Mayer Brown have ongoing relationships with Rep. Price, which certainly will be helpful as the changeover at HHS takes effect.